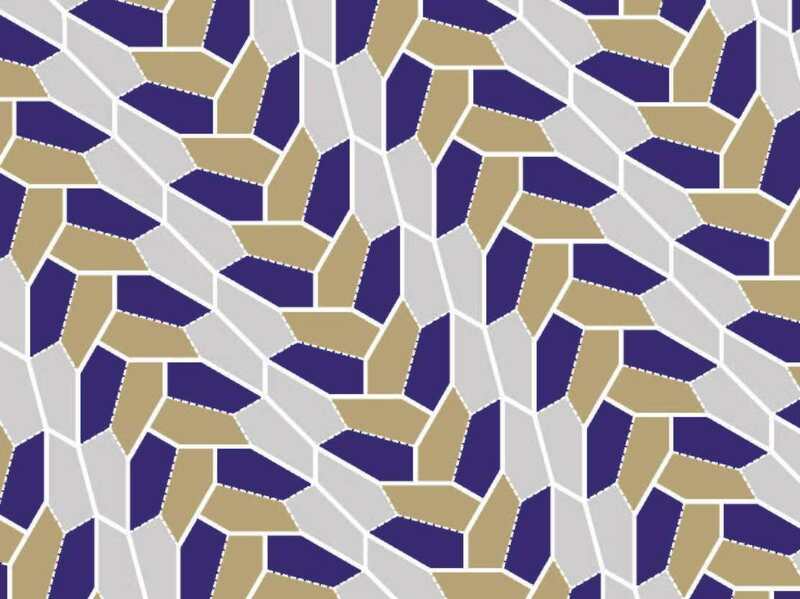 With Discovery, 3 Scientists Chip Away At An Unsolvable Math Problem : The Two-Way For decades, we have known of only 14 convex pentagons that can do something called "tiling the plane." Now there is a 15th shape, but mathematicians are still far from knowing exactly how many exist. There are now 15 known convex pentagons, or nonregular pentagons with the angles pointing outward, that can "tile the plane." Jennifer McLoud-Mann had almost come to believe that her last two years of work had been for naught. "It had gotten to the point, where we hadn't found anything," she said. "And I was starting to believe I just don't know if we're going to find anything." Armed with an algorithm, McLoud-Mann, along with her husband, Casey Mann, and David Von Derau — all of the University of Washington, Bothell — had been trying to help unravel one of math's long-standing unanswered questions. How many shapes are able to "tile the plane" — meaning the shapes can fit together perfectly to cover any flat surface without overlapping or leaving any gaps. 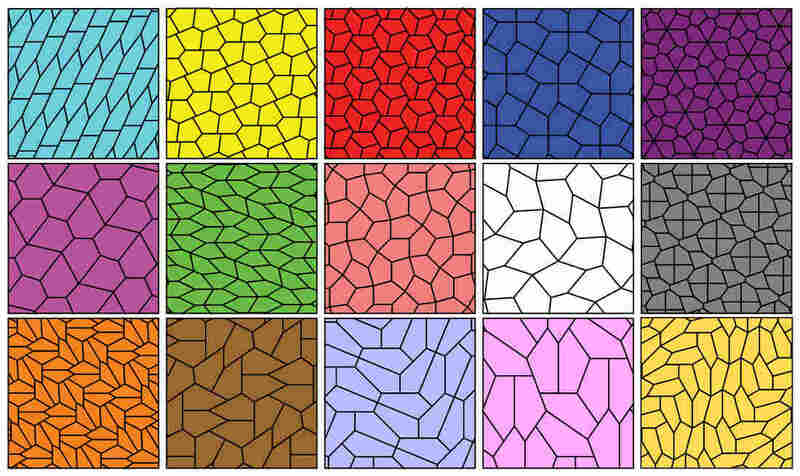 Mathematicians have proved that all triangles and quadrilaterals, or shapes with four sides, can tile the plane, and they have documented all of the convex hexagons that can do it. But it gets a lot more complicated when dealing with pentagons — specifically convex, or nonregular pentagons with the angles pointing outward. The number of convex pentagons is infinite — and so is the number that could potentially tile the plane. It's a problem that's almost unsolvable because, as McLoud-Mann put it, it has "infinitely many possibilities." It's a problem that also intrigued her because it was so simple that anyone could start working toward a solution using pencil and paper. "The cool thing in mathematics is that sometimes you have a simply stated problem that doesn't have a simple solution," she said. In other words: It's possible that that there are dozens — hundreds, thousands even — of these convex pentagon shapes waiting to be discovered. Up until last month, only 14 had been found, and for all anyone knew, that list could have been final. But last month, a cluster of computers that Von Derau was using to run though different shapes spit out an intriguing possibility. He sent it to McLoud-Mann, who said she was excited but suspicious. She had been sifting through the data coming out of the cluster, and most of the time when she checked the computers' work, the shapes turned out to be one of two things: an impossible pentagon — meaning one that didn't fit the mathematical definition of a convex pentagon — or one that already fit into the 14 types that had been found. This time it was different. She ran the data over to her husband's office. She told him that they needed to make a picture of it immediately. The 15th convex pentagon found to be able to tile a plane. The three mathematicians had discovered the first new convex pentagon able to tile the plane in some 30 years. The scientists had become a part of a legendary history that dates to 1918, when the German mathematician Karl Reinhardt described the first five types of pentagons to be able to tile the plane. Until last month, only four others had added to that canon: R.B. Kershner found three more types in 1968; Richard James added one type in 1975; after reading about James' find in Scientific American, Marjorie Rice, a housewife and amateur mathematician, added four types that same year. Rolf Stein found a 14th type in 1985. After McLoud-Mann and her team found No. 15, they celebrated at home. Maybe, McLoud-Mann said, they could tile a spot in their house with the new shape. Maybe the university could tile a spot on campus, like the Mathematical Association of America in Washington, D.C., did with one of the shapes discovered by Rice. Asked if she had hopes that the team's algorithm would find more of these pentagons, McLoud-Mann let out a sigh. "Oh, I don't know. I don't know," she said. So, again, the problem with this mathematical problem is that it has infinite possibilities, so there's no way to know when you're done or if the list of shapes is complete. "Sometimes, what mathematicians try to do," she said, "is simply try to chip away at the problem."